THE “alarmball,” illustrated in accompanying photo, is a clever little device to prevent burglaries. 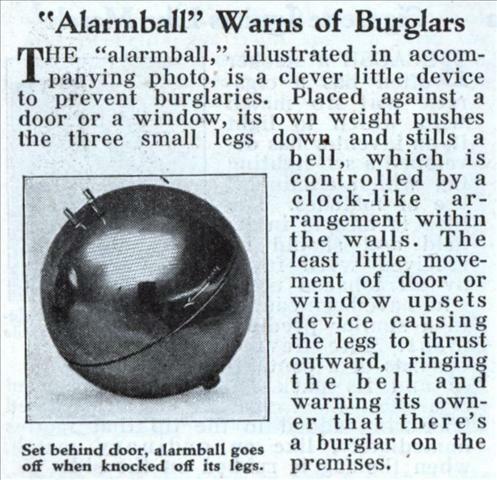 Placed against a door or a window, its own weight pushes the three small legs down and stills a bell, which is controlled by a clock-like arrangement within the walls. The least little movement of door or window upsets device causing the legs to thrust outward, ringing the bell and warning its owner that there’s a burglar on the premises. This thing reminds me of the flying spheres from the “Phantasm” movies. The ones with the knives, drills and flesh burrowing devices. Now that would be a burglar deterent. You can’t fool me, that is Sputnik. This would be useful for hotel rooms, but not so much for home, especially if doggie decides he wants to play with the shiny ball! Hanna, You nailed it.. Right between the eyes! That was exactly my thought. Small world…I was thinking of the ball from “Phantasm” as well.